ER. Firstly, why did you call the project the London Sound Survey, I’m thinking particularly about the use of the word ‘survey’ and not ‘map’ or ‘archive’? IR. 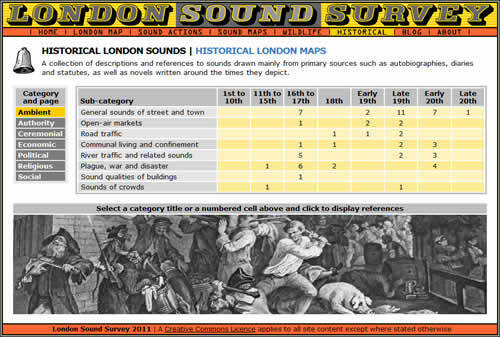 ‘Survey’ is open-ended and suggests a work in progress, which is what the London Sound Survey is. Sound maps of various kinds are part of the site, but there are other things there too, like historical references. It was a struggle coming up with names and ‘London Sound Survey’ was the least bad of them. It sounded neutral and ageless. ER. Can you talk about the origins of the project, its inspirations, how it came about, and what some of your initial aims were? IR. The thinking came about slowly. I’d lived away from London for about ten years and found it hard to settle for a while when I moved back. London struck me as very anonymous and indifferent. Literary attempts to describe the city as an organism or having some sort of enduring spirit just seemed fanciful. It couldn’t be summed up in words alone. I had a vague idea that London was maybe better grasped through a statistical or sampling approach, close to what I was then studying at night school. 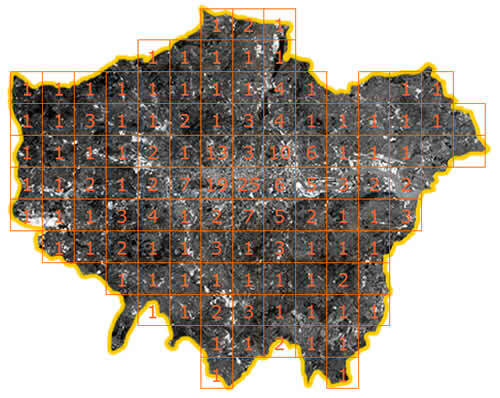 Around the year 2000 websites started popping up with an appealing worm’s-eye view of London. One favourite was Adrian Maddox’s ‘Classic Cafes’, and there were others which had photographs of derelict buildings, or were about subterranean rivers like the Effra and so on. There was also then a revival of interest in local history under the fashionable title of ‘psychogeography’, which hardly anyone can now say aloud without looking sheepish. I wanted to do make my own London website but I couldn’t come up with anything original. This changed when I began working at the British Library Sound Archive as one of the two Vaultkeepers there. It’s like a storeman’s job where you take care of all the collection materials: hundreds of thousands of CDs, records, tapes, minidiscs, cassettes, wax cylinders and wire recordings. Many hours were spent going through the shelves just to discover what was there. A lot of the tapes hold field recordings such as wildlife sounds and the results of ethnographic field trips. Not all of them are made by full-time professionals. Amateur recordists have contributed a great deal as well, and so field recording began to look like a worthwhile hobby to get into. Two chance discoveries in the Archive really helped things along. One was a CD from Steven Feld’s ‘The Time of Bells’ series, which was lying around on a table waiting to be put away, and the other was the Vancouver Soundscape LP, found while unpacking a crate. Feld noted that he’d used Sonic Studios microphones and on online search led to Aaron Ximm’s ‘Quiet American’ website, as he also uses them. Ximm’s site has a lot of helpful information, and the ‘one-minute vacation’ recordings there showed how even quite short recordings could be satisfying to listen to and give a vivid idea of what a place was like. Another inspirational website was the Xeno Canto birdsong collection and database. ER. Sound in urban environments has a notoriously negative reputation for being a ‘noisy nuisance’. Are you trying to re-address this often negative perception of environmental urban sound? IR. Not really, no. It’s already been done effectively by projects like Peter Cusack’s ‘Your Favorite Sounds’ series, which is an example of crowd sourcing before the term existed. There’s also the ‘Positive Soundscapes’ research program which has a chance of influencing urban planning and achieving something in the wider world. I hope that urban sounds can be recognised as informative in their own right and worth studying. There’s a common assumption that sound should be the support act to vision, at least for documentary purposes. It’d be good to help redress that even in a small way. 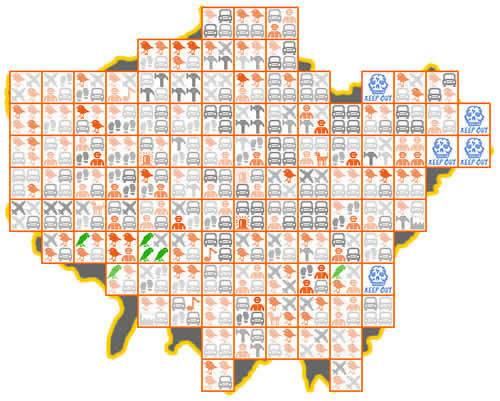 Not all the recordings on the London Sound Survey are particularly uplifting and hopefully it doesn’t come across as a celebration of the city, just an investigation of it through the organising principle of sound. ER. Can you talk about the role of maps in the work? IR. There are several different maps mainly because it’s fun playing around with graphics, but also because a map can depict part of a recording’s context very easily. I use a grid with 112 squares in it to pigeonhole recordings into different areas. Each square’s about 2½ miles or 4 km across, and for a while I went around with a GPS receiver trying to get to the exact middle of every square to record whatever sounds were present. It was a good excuse to go climbing over fences and trespassing on golf courses and other privately owned land. The results were plotted on a map made up of little symbols showing what sorts of noises occur where and how prominent they are. I don’t use Google Maps because they’re everywhere and they aren’t needed for something the size of a city. I worried that they might also be visually distracting, with site visitors wandering off to look at Timbuktu or the Faroe Islands rather than listen to the sounds on it. But some Google-based sound maps are very impressive and with them you’re unlikely to drift elsewhere. Radio Aporee in particular has so much to listen to, and it’s got a compelling interface that holds the attention. ER. The site itself is now an important sound archive of present day London, but there’s also a real engagement with the history of London. Can you talk about how you incorporate a sense of past into the site? IR. Sounds which people make on purpose have their own histories. Everyone knows something about the development of music over time, but other sound signals are also inventions which people adapt and refine. Examples include car horns, church bells, football chants, police whistles, public oratory, political sloganeering, factory hooters, begging and street sellers’ cries. I was hoping to get hold of some old sound recordings for the site, but the rights issues were a headache. Portable field recording equipment hasn’t been around that long in historical terms, and the shadow of mechanical copyright falls over much of that time. So it was better to follow the path of least resistance and this meant hunting for written references in old books instead. It’s a nice way to spend a rainy day. The site now has a few hundred historical references organised into a simple database. The further back you go the harder it is to find such references, partly because writers before the 19th century dwell more on action and dialogue than on sensory descriptions. Samuel Pepys’s diaries stand out because he was skilled musically and their privacy and confessional nature let him describe sounds that startled and alarmed him. 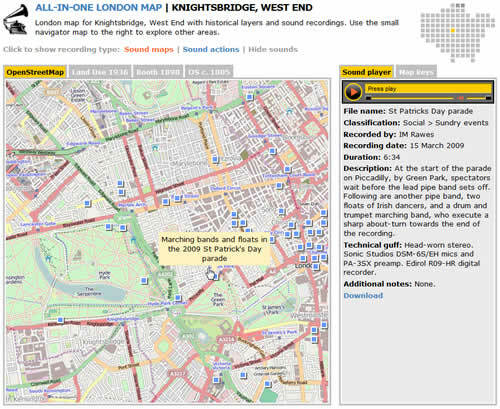 A new site section simply called the ‘London Map’ is putting all the sound recordings together in one place. I’ve been having old maps scanned so you can switch between different map layers going from the present back through time. For one of the layers the London School of Economics let me have some beautiful scans of the Booth Poverty Survey maps from the end of the 19th century, which show levels of wealth for individual streets through colour-coding. In some districts those relative patterns haven’t changed much since then. There’s also a more ambitious historical project earmarked for 2011, hopefully with someone else getting involved. ER. You also offer technical advice on the site, is this something that has come out of demand from users? IR. Now and again emails and comments arrive asking about this or that mic or recorder. I try and answer those as best I can, and once compiled a specification list for all the head-worn or binaural mics I could find information on, thinking that might be useful to someone. But otherwise I’m not at all qualified to give detailed advice on sound recording in general. The nature recordists group on Yahoo has got some very knowledgeable people like Rob Danielson contributing, so that’s a good place to go to learn things. ER. Do you have any favorite spots to record in the capital? What are some of your most interesting experiences/revelations you’ve had whilst listening to the City? IR. I like the Thames more as it goes east where you get a mixture of industry, scraps of marshland, housing, and seemingly un-owned bits of land which are used for scrambler bikes and clay-pigeon shooting. The city centre always has a lot going on but it’s too easy to concentrate on it to the neglect of other areas. Brixton has a wide array of soundscapes because it’s the pole star of Caribbean culture in London and there are several indoor and street markets. It attracts a lot of buskers and soapbox preachers too. Any place where there’s still street life of some kind is worth checking out. Making the dawn chorus recordings was interesting because of having to catch the night bus to get to the recording spots. You’d hear amazing arguments, soul-bearing conversations, people being sick, or trying to walk along the aisle before collapsing sideways across someone just sitting and minding their own business – the miracles of alcohol. I wish I’d recorded some of that. The happiest experience was recording bat sonar for the first time, jump up and down happy. Next best was finding an old man who’d I’d heard reciting poems in the street about two years earlier and had been looking for ever since. On that first occasion the batteries in the recorder had gone flat. I’m not sure about revelations; it’s more like making clear those things which were known in a vague way before. The peacefulness of much of London and the private-ness of most people’s lives, how they’re often heard rather than seen. Also, how widespread the sounds of birdsong are, nearly everywhere. ER. Is there an ideal user of the site? IR. Anyone who leaves a comment, sends an email, tells other people about it, makes use of the sounds on it, or gets some pleasure from it. ER. And finally as always, Ear Room asks, what does the term ‘sound art’ mean to you? IR. Sound art is part of the general expansion of art over the last two or three decades, due to great changes in the economy and the growth of higher education. It’s one of the countless ways in which people are adapting to labour casualisation. I haven’t met many sound artists, but those I have strike me as imaginative and technically inventive people. 30 or 40 years ago they’d likely have been working in the electronics industry, in research and development, or education. Education is now almost the only route by which some can eventually stabilise their incomes. I tend to think of sound art as something that happens in galleries or as part of an installation somewhere, like the Singing Ringing Tree sculpture in the Pennines. There’s all sorts of ways in which sound art could be disseminated – through iPhone apps, websites, memory sticks, you name it. But social events and physical objects will probably always be more highly thought of than the delivery of pure data, because they’re what our minds have evolved to grapple with and to appreciate. Pingback: London Sound Survey – La audiolibrería de la City | ¿A qué suenan las nubes?